The Unknown Spy by Eoin McNamee. A Ring of Five Book. Review: When you are a spy and your school is in the underworld you are not considered a normal person. In The Ring of Five: The Unknown Spy written by Eoin McNamee Danny Caulfield is a student at Wilsons Spy Academy who is supposedly returning over the holidays. He and his friends have always been mischievous, and this semester is no different. But when they venture too far they find the groundbreaking truth. They are going on another mission and this time the future of the upper world depends on it. They have to find the treaty of stone against agents of a rivaling academy in a kingdom that migrates. Now Danny and Dixie have to venture into the Kingdom of Morne to save the two worlds. Will they rescue the stone treaty or will all hope be lost? Dixie has the talent of teleporting and can move from place to place secretly. Les is a messenger and can fly like an angel. Toxique is an assassin but doesn't like to kill. Vandra is a "pshysick" and can heal people by sucking the poison out of them and can cure infections. While Vandra is stuck in the infirmary, Toxique is still trying to assassinate someone, and Les is not able to go into the upper world with his wings, Danny and Dixie set off on an adventure. The enemy has already launched their team and the race is on. Will Danny and Dixie make it there first? Eoin McNamee is a spectacular writer and can write tremendous books. This action book will literally astound middle grade readers just like it astounded me. If he can write two phenomenal books then he can a accomplish a third…then a fourth… then a fifth… etc. If I could read this book, forget everything and read it again, I would do it a thousand times. The Ring of Five: The Unknown Spy is a must have. This book should be put in absolutely every library. I enjoyed reading this marvelous book and so will you. The quote I found fascinating was "Not as important as family," because Dixie was a friend but Lily was family. It made me think about just how important family is. That is also appealing because it lead Danny to a decision- making moment on whether to save Dixie or to run away with Lily. Danny is just a normal kid- with attributes that can relate to anyone. He is deceptive but doesn't always like to lie. Plus he is always fighting his temptation to join "The Ring". Danny also has a loving and good natured side. He would save his friend if it meant the end of the world. 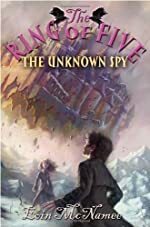 The Ring of Five: The Unknown Spy surprised me with its greatness and the mixture of mystery and adventure. This book's red herrings may confuse you but this book will never lose you. The Ring of Five: The Unknown Spy is truly incredible. We would like to thank Random House for providing a copy of The Unknown Spy for this review. Have you read The Unknown Spy? How would you rate it?